Despite considerable attention just given to suturing techniques, it is felt that one recent suturing method requires separate consideration. Initially Hoznek et al. 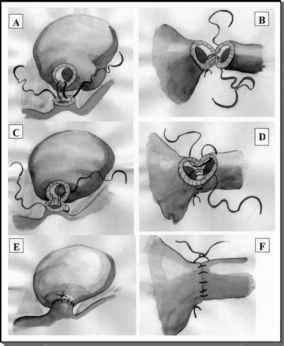 described a simplified urethrovesical anastomosis using a two-hemicircle suture with three intra-corporeal knots (165). Van Velthoven further simplified this technique by pretying two 6-inch, 3-0 polyglycolic acid sutures (one dyed and one undyed). Both needles are passed through the posterior bladder neck at the 6 o'clock position where the knot rests (Fig. 36). Sewing upward on either side of this results in a watertight closure. If a bladder discrepancy exists, the suture line can be run onto the anterior bladder neck forming a tennis-racket closure. Van Velthoven et al. report utilization in 122 laparoscopic and 8 robot-assisted radical prostatectomies with an average anastomotic time of 35 minutes. They have had no postoperative anastomotic leaks, and at short-term follow-up have reported no symptomatic bladder neck contractures (166). Menon's group has taken this technique and rapidly expanded its clinical application in the robot-assisted Vattakuti Institute Prostatechomy (Mani Menon, M.D.) series at Henry Ford Hospital. Now with over 500 consecutive cases presented, the mean operating time has dwindled to 150 minutes (167). FIGURE 35 ■ Suspension stitch technique for converting square knots to slipknots. Primary utility for end-to-end laparoscopic anastomoses. (A) Square knot opposing pulls to set. (B) Apposing tension to same side threads converts square knot to slipknot configuration. (C) Advancement of slip configuration. Finally, reconversion to square knot by apposing pulls as in top right. Source: Modified from Ref. 150. 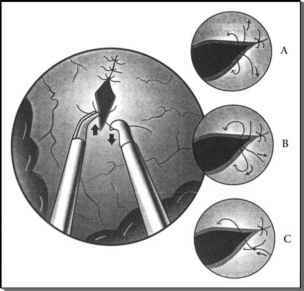 FIGURE 36 ■ Van Velthouven's method of running vesicourethral anastomosis with a single intracorporeal knot. Two 6-inch lengths are tied together extracorporeal^ with two different-colored absorbable sutures. reconstructive urology. Basic research may yet solve some of the dilemmas such as the ideal length of a running suture (168).